On a computer that has the AD DS Tools installed from the Remote Server Administration Tools, or on a domain controller, open Active Directory Users and Computers. 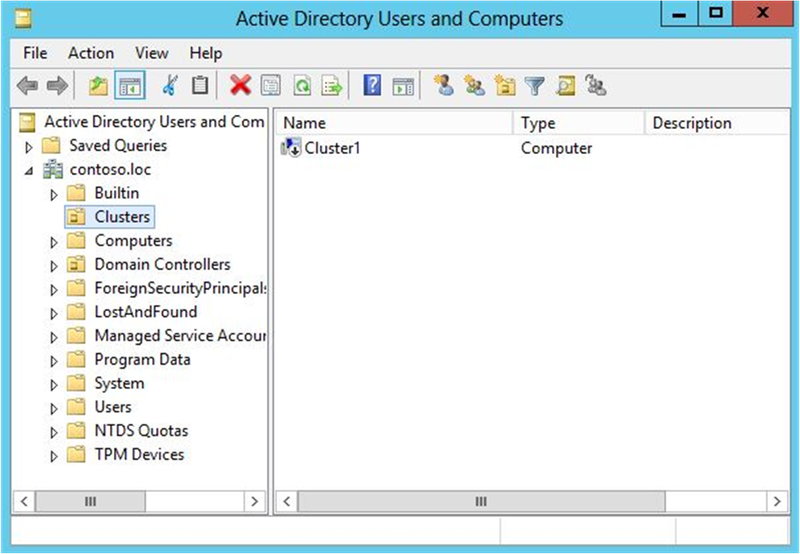 To do this on a server, start Server Manager, and then on the Tools menu, select Active Directory Users and Computers. To create an OU for the cluster computer objects, right-click the domain name or an existing OU, point to New, and then select Organizational Unit. In the Name box, enter the name of the OU, and then select OK. In the console tree, right-click the OU where you want to create the CNO, point to New, and then select Computer. In the Computer name box, enter the name that will be used for the failover cluster, and then select OK.
As a best practice, right-click the computer account that you just created, select Properties, and then select the Object tab. On the Object tab, select the Protect object from accidental deletion check box, and then select OK.
Right-click the computer account that you just created, and then select Disable Account. Select Yes to confirm, and then select OK. Locate and then right-click the CNO, and then select Properties. On the Security tab, select Add. 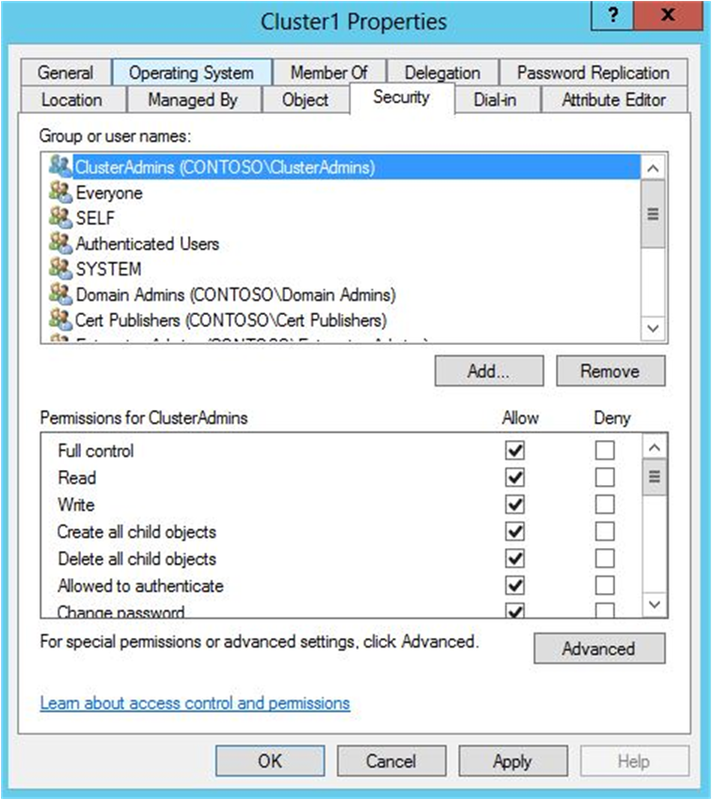 In the Select Users, Computers, or Groups dialog box, specify the user account or group that you want to grant permissions to, and then select OK.
Option 1: Grant the CNO permissions to the OU. 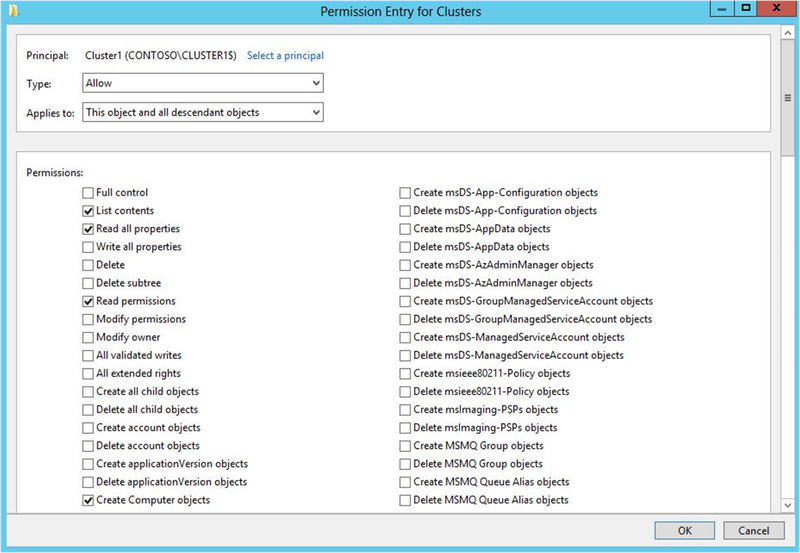 If you use this option, the cluster can automatically create VCOs in AD DS. Therefore, an administrator for the failover cluster can create clustered roles without having to request that you prestage VCOs in AD DS. Option 2: Prestage a VCO for a clustered role. Use this option if it is necessary to prestage accounts for clustered roles because of requirements in your organization. For example, you may want to control the naming convention, or control which clustered roles are created. Right-click the OU where you created the CNO in Step 1: Prestage the CNO in AD DS, and then select Properties. On the Security tab, select Advanced. In the Advanced Security Settings dialog box, select Add. Next to Principal, select Select a principal. In the Select User, Computer, Service Account, or Groups dialog box, select Object Types, select the Computers check box, and then select OK. Under Enter the object names to select, enter the name of the CNO, select Check Names, and then select OK. In response to the warning message that says that you are about to add a disabled object, select OK. Select OK until you return to the Active Directory Users and Computers snap-in. In Active Directory Users and Computers, right-click the OU where the CNO for the cluster resides, point to New, and then select Computer. In the Computer name box, enter the name that you will use for the clustered role, and then select OK.
Right-click the computer account that you just created, and then select Properties. Under Enter the object names to select, enter the name of the CNO, select Check Names, and then select OK. If you receive a warning message that says that you are about to add a disabled object, select OK.